Tuesday we issued a Winter Real Food Challenge to consume bone broth daily until Valentine’s Day. Take the pledge and be entered to win a free Menu Mailer and Recipe Archive subscription. Today I am drinking my beef broth straight. My dad was taken to the ER by ambulance in the wee hours of Wednesday morning. Today I am bouncing between the two households, cleaning, cooking up some nourishing meals and taking care of both of my parents. I am too tired to do anything else. I simply heat it up, add a little salt to taste and sip it from a mug, just like I would coffee or hot chocolate. For a long time, I would scrimp and save up bones, carefully purchase any extra bones, backs and feet I needed at the best prices I could find, then spend money on the stock making by using whole and meal-worthy carrots, onions and celery to flavor the broth. One day I realized that we have scraps from vegetables that we can use in broth, too. I was aggravated at myself for not recognizing it sooner. I was working hard to keep the budget as tight as possible, all the while throwing away vegetables that were perfectly fine for use in broth! When I use carrots, I scrub them thoroughly then trim off and discard any bad spots. I cut off the end and the tip, peel the carrot and then throw the tips and the peels into a freezer bag along with the bones. For onions, you almost always have a small root end left over from dicing. I cut the brown, shaggy part of the root off and discard it, then throw that piece of leftover white onion flesh into my freezer bag, too. Finally, you can use the tops and very middle, white area on celery in bone broth. This often means that I make a batch of stock using nothing but ‘free’ items that most people throw away without a second thought. The broth just costs me a little time, a glug of white vinegar and the electricity needed for the crock-pot. I refuse to stand at a cutting board and spend time chopping veggies. I use the food processor and place each type of veggie into the processor individually and pulse until diced to the size I want it. 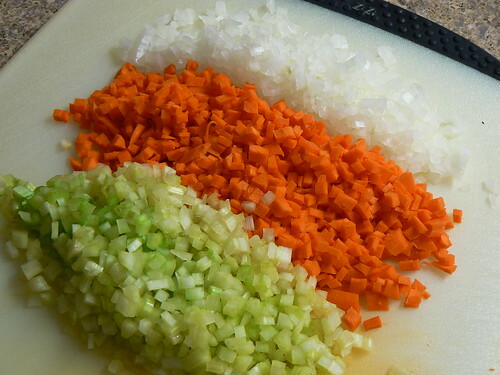 To make this process easier on myself, I chop and cook at least one week’s worth of celery, carrot and onion at once. I place the diced veggies into a stock pot, add a little fat and cook it together. Once it is cooked and cooled, I portion the veggies up into freezer containers and store them in the freezer for use later in the week. I then proceed to make a dish or a soup in the stock-pot, so I’m not washing extra dishes. This saves me a significant amount of time in the kitchen each week. I then proceed with making stock in the crock-pot with the bones and veggie scraps I have on hand. This process saves me at least ten minutes a night of hands-on time, plus not having to wash the food processor or a knife and cutting board every night. When I need the prepared veggies, I thaw them in the refrigerator the morning that they will be used. When I dump the veggies into the pan while cooking dinner, I do not put the container into the dishwasher. Instead, I set it aside and use that container to hold the leftovers of that meal to go into the fridge or freezer. Voila, even fewer dishes to wash.
Batch cooking is your friend. I love bone broth. It’s such a wonderful food. And I was so happy to see you remind folks not to throw out scraps but instead to save them for the stock pot. I usually always have a pot of broth going and I throw in my scraps into the pot as I cook other things. I try to waste nothing. I remember watching Rachel Ray years ago as she tossed so much “good stuff” into her garbage bowl. She could have made many 30 minute meals from those scraps! LOL! Recently discovered your blog and am so glad I did! 1. When cooking broth in the crock pot, how long does it usually take on high before it comes to a boil? I’ve tried it in the crock pot once before, but I know I had it overfull, and it just didn’t work out right. Now I’m hesitant to try again, until I know more about it. 2. I’ve also heard of people using things like potato peels and broccoli stalks (not the florets) in their bone broth. What do you think about those 2 items? I’ve also wondered about summer and winter squash peelings? Speaking of broth… I need to go strain mine and put it in jars LOL. Thanks again for the great info and blog etc etc! Sarah, I’ve never stood by and timed it, but I’d guess around 30-45 minutes to boil. It depends on the type of crock-pot you have. I don’t like to put potatoes into stock as it makes it cloudy. I don’t put strongly flavored veggies like broccoli, because I don’t want to have to track what I put in each stock to avoid using it in a dish where the flavors would conflict. I think it would be ok if you were going to use it for something specific, like making chicken stock with some broccoli stems that you then turn into cream of broccoli soup. I prefer to peel and slice broccoli stems and use it in a stir-fry instead of doing things like stock with it. Bone broth is amazing! I’m pregnant and at about 12 weeks I started having terrible ligament pain. OB’s response was “well now, that doesn’t bode well for your pregnancy, does it?”. Chiropracter’s response was “OH, try bone broth every day– from a large weight bearing animal like a cow! It’s a lack of trace minerals most likely.” — Sure enough bone broth every day! I’ve always saved my veggy scraps in the freezer, and my bones too for stock making- which I make in huge batches and then can in a pressure canner. Onion skins will give your broth a lovely brown color by the way. I make soup in large batches and then have soup made with my bone broth every morning for breakfast. Perfectly soothing first thing in the morning for my restless stomach, hearty, and nourishing! And it heats up quickly so I don’t have to wait while bacon and eggs cook. I’m completely in on the resolution allthough I’d be willing to bet I’ll miss a couple of days in Feb while I’m in the hospital having my baby. Laura recently posted..More experiments in sugar free canning! I also save the ends of my onions and all my celery leaves for making stock. Reading this has made me realise I’ve been forgetting to save my carrot tops and tails though. I’m making a mental note to myself to start doing that again. Hubby being even more frugal than me LOVES that I “make food from garbage”. Great minds think alike – I do alot of those same things!